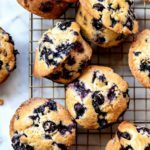 Even though there's no oil in this recipe, these muffins come out perfectly moist with the perfect rise every time. Fill the muffin tins to the top with batter for the perfect muffin top. Preheat the oven to 375 degrees. Prepare a12 tin muffin tin with liners or spray with non-stick cooking spray. Whisk together the butter, eggs and milk in a medium bowl. In a large bowl, whisk flour, 3/4 cup sugar, baking powder and salt. Stir wet ingredients into dry ingredients then gently fold in blueberries. Divide the batter evenly among the muffin tins. Bake for 25-30 minutes or until an inserted toothpick tests clean. Eat warm with more butter (my daughter’s favorite way) or at room temperature.